Learning about our environment through eagle eyes! As top predators, raptors have long been recognised as important biological indicators of healthy ecosystems. Their position at the top of the food chain means that raptors can be used to demonstrate a diverse range of environmental issues which affect our countryside. However, more importantly these top predators command a special interest and respect, particularly with younger audiences and therefore are a perfect conduit through which to learn about biodiversity in a fun and informative way. BirdWatch Ireland, with Galway, Clare and Tipperary County Councils and with funding from the Heritage Council have produced workbooks on raptors for primary schools. 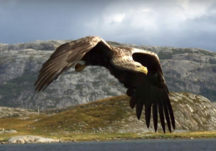 These workbooks describe the different types of raptors which live in Galway and explore topics such as ecosystems, food chains, adaptations, conservation threats, and the importance of a healthy environment – all of which are introduced through images, graphics and animations, fun facts and games! Check them out below. BirdWatch Ireland and Galway County Council also carry out environmental education initiatives in primary schools in Galway where the children learn about local raptor populations and other wildlife in their area, and help participate with local conservation projects – check out some videos from a visit to St. Feichins National School in Abbey where BirdWatch Ireland talk about raptors in Galway, with loads of cool facts and stories to showcase these amazing birds and why they are important in our countryside. Galway County Council support BirdWatch Ireland to carry out research and monitoring of birds of prey in Galway to learn more about their status and conservation requirements, and to increase awareness and appreciation for biodiversity in Galway.